Favorites take many forms. I love working on the computer and learning something new. PicMonkey is a favorite online (free so far) program. Decorating my Welsh dresser is another favorite activity. Reading posts is another. Together they made this post. Making different banners is always fun, and when reading blogs on Alison's Friday's Unfolded Stuff and Nonsense's linky party there was a grain sack banner. Just what the Welsh dresser hutch needed. 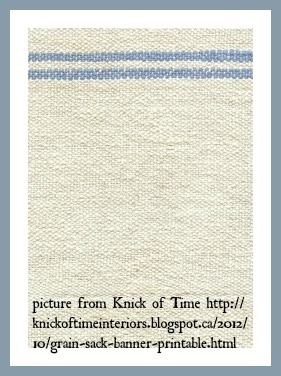 Angie who writes Knick of Time posted "Make Your Own Grain Sack Banner". Check Angie's post here - she took a clear picture of a grain sack to share, just drag her photo onto your desk top and use it to make ..... a banner. What a great idea. 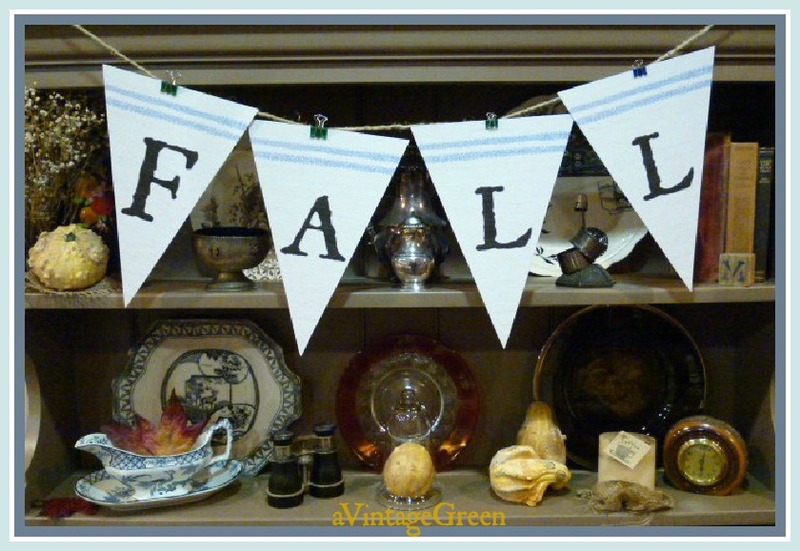 Go to Angie's blog if you want to take a copy of the blank grain sack. 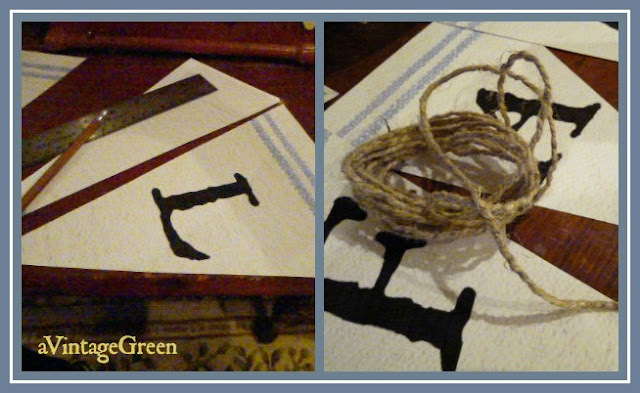 Angie used a stencil and paint to make her letters but also suggested (which was brilliant) that her European Grain Sack picture could be opened in PicMonkey and that the letters you want could be added to the Grain Sack picture. and used Roman Antique in PicMonkey's new Halloween fonts. Print each letter on a separate page. Next step: using a ruler/pencil and scissors turn each page into a triangle. Colored metal clips hold the letters to a length of thick hemp string. Rearranged my Welsh hutch and added the new banner. Thank you Angie of Knick of Time for the inspiration for this post. Check here to see the banners I made earlier this week. The waxed leaves in these collages have lasted since last October - post here. Joy - That's so cool - thanks for sharing! Really nice! I like the way you clipped the pennants to the twine. I would have spent hours trying to glue or sew. Very clever! Oh wow! this is wonderful. I hadn't been over to KOT yet to see this post...Now...I'm going there for sure. Thanks for the easy Tutorial. I am going to give this a try. You make it sound so simple, and we'll see if my computer challenged brain can figure it out! I love how you've decorated your cupboard! This is great, and THANK YOU for mentioning PicMonkey. For weeks I've been trying to remember that site's name. Thanks so much for joining in this week, Joy. That is so pretty, Joy! I can see that I need to jump on that PicMonkey bandwagon! I love that first photo especially. Can you believe I have yet to make a single banner??? I use Pic Monkey and like it a lot! Love the banner! I need to try to make one! So glad you enjoyed my grainsack images and banner, Joy! Yours turned out wonderful!!! What a cute idea! I need to spend a bit more time there and use more of their features. hey Joy ... love your banner. Angie offers some great Free graphics. 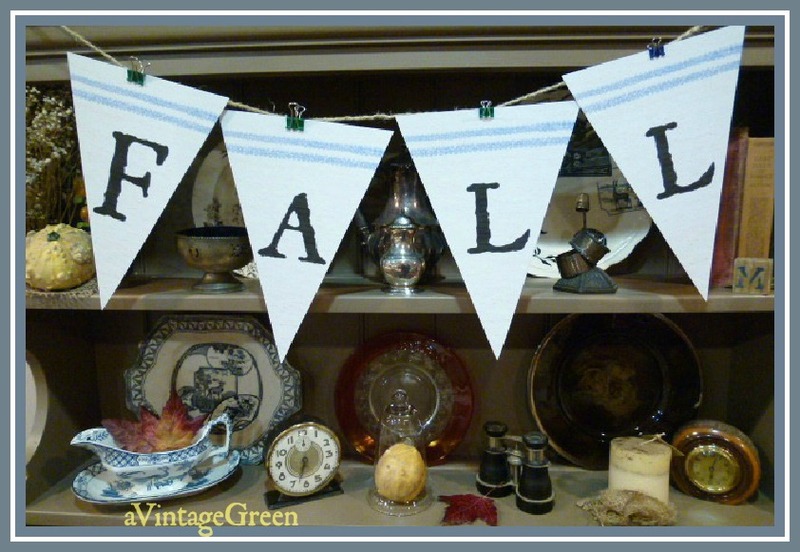 Banners seem to be very popular, but I have yet to make one. Great look for you. 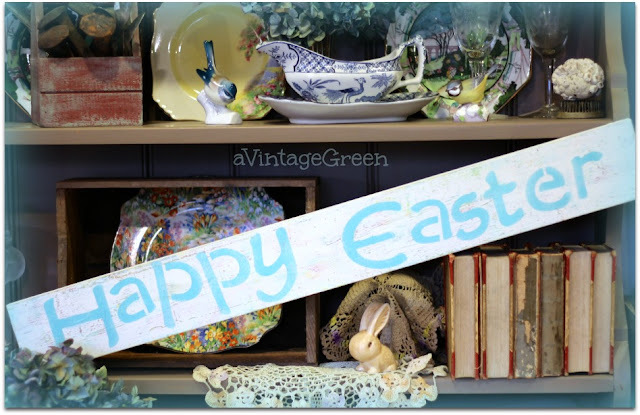 Love the banner and the collection in the dresser is beautiful! What a cleaver idea! I am your newest follower. This is so cute! Thank you so much for sharing your tutorial! Angie always has the best tips...it's great to see that you've put one into action! Great Post...lovely photographs! I came back again. What a good time I'm having reading your posts. It's the best way to spend part of a rainy Sunday.